American comparative psychologists of the mid-20th Century shared some basic assumptions. One was that learning involved associations between stimuli and responses. All associations were assumed to be equally easy for animals to form. That assumption was easily challenged by ethologists. Ethologists pointed to cases in which learning occurred very rapidly, or not at all, because of biological factors. 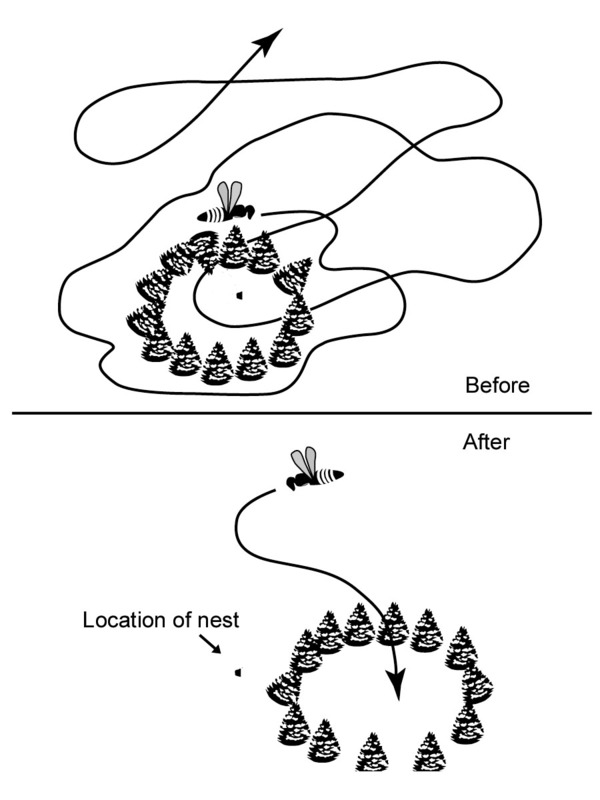 In one experiment, Tinbergen (1951) put a ring of pine cones around a digger wasp nest. The wasp spent longer than usual circling the nest when it came out of the hole, then it flew off to find food. When the wasp was gone, Tinbergen moved the pine cones, putting them around a different hole that he made by poking a stick into the ground. When the wasp returned, it went to the new hole that had cones around it. Tinbergen pointed out the implications of this. Apparently the wasp memorized the objects in the vicinity of the nest in just a few seconds, while circling before her flight to find food. What was Tinbergen's experiment with the wasp? Why would a wasp be so "smart" at memorizing objects near the nest? The answer is that the wasp's survival and reproductive success depends upon this skill. The same was true of its ancestors. Digger wasps that memorized objects near a nest found their way back to it, reproduced, and passed on their genes (including genes enabling this ability). This does not indicate that digger wasps are generally smarter than other insect species. They have a special talent adapted to their life circum­stances. This can be called instinct, or biologically-prepared learning, or adaptive intelligence. Examples like the digger wasp contradict a bedrock assumption of old-time behaviorists, the idea that everything is equally easy to learn. This "equivalence of associations" assumption was discussed on the page about laws of learning. Behavioral psychologists from Pavlov to Watson to Skinner believed that all stimuli were equal, when it came to learning. Learning was assumed to involve links or associations between stimuli and responses. Any stimulus was supposed to be as good as any other stimulus, for forming an association. Therefore (the thinking went) psychologists only had to locate the laws of learning, and they would understand all animal behavior. What was the equivalence of associations assumption? By the 1970s, psychologists had awakened to the fact that not all associations between stimuli were equally easy to learn. To predict animal behavior, you had to know more than the laws of learning. You had to know what forms of learning were positively selected in the animal's ancestral environment. If animals are required to make a natural response to a situation, they learned quickly. If forced to make an unnatural response, they learned slowly or not at all. For example, pigeons have a difficult time learning to peck a key to avoid a shock (Seligman, 1970). Avoidance learning is usually easy to establish, but not in this case. Pecking is a behavior associated with feeding. It is not natural for a pigeon to peck something to avoid pain. They can learn it, but with great difficulty. Why is it difficult to train a pigeon to peck a key, to avoid a shock? A bird's natural response to a stimulus warning of danger is to fly away. Pigeons learn very quickly, in a single trial, to fly off a perch in response to a signal predicting a shock. Pigeons also learn easily to peck a key to get food. They even "train themselves" to peck a key for food, a phenomenon called autoshaping. Autoshaping occurs if a pigeon is put in an operant chamber where pecking a lighted key results in grain delivery. Pigeons learn to peck the key when it lights up without further encouragement by humans. What is autoshaping and what does it show? This "self-shaping" shows learning is easy, when a response comes naturally. Thorndike, alone among early compar­ative psychologists, recognized this phenomenon. He called it prepared­ness. A pigeon is prepared to learn pecking, as a way of getting food. Not only are natural behaviors easier to learn; they can override more artificial, trained behaviors. This was discovered when animals were trained to do human-like behaviors, using operant condition­ing techniques. Over time, the learned performances may deteriorate as bits of species-typical behavior intrude on the performance. Breland and Breland (1961) called this "instinctive drift." What is "prepared" learning? What was the phenomenon the Brelands called "instinctive drift"? The Brelands trained animals for road­side tourist attractions in the 1950s. Using standard conditioning techniques, they taught animals to perform complex behaviors for food reinforcement. In many cases, after the behavior was established, it was disrupted by some intrusion of instinctive behavior. For example, they successfully taught a raccoon to deposit wooden coins into a metal container for food reinforcement. But soon the raccoon started rubbing the coins together and dipping them (not dropping them) into the container. The raccoon was performing the motor program used by raccoons to wash food in a stream. If you rescued a baby raccoon and raised it at home, it would do the same thing with food you gave it. It would seek water to wash the food. This interfered with the trick so much that the Brelands gave up on it. 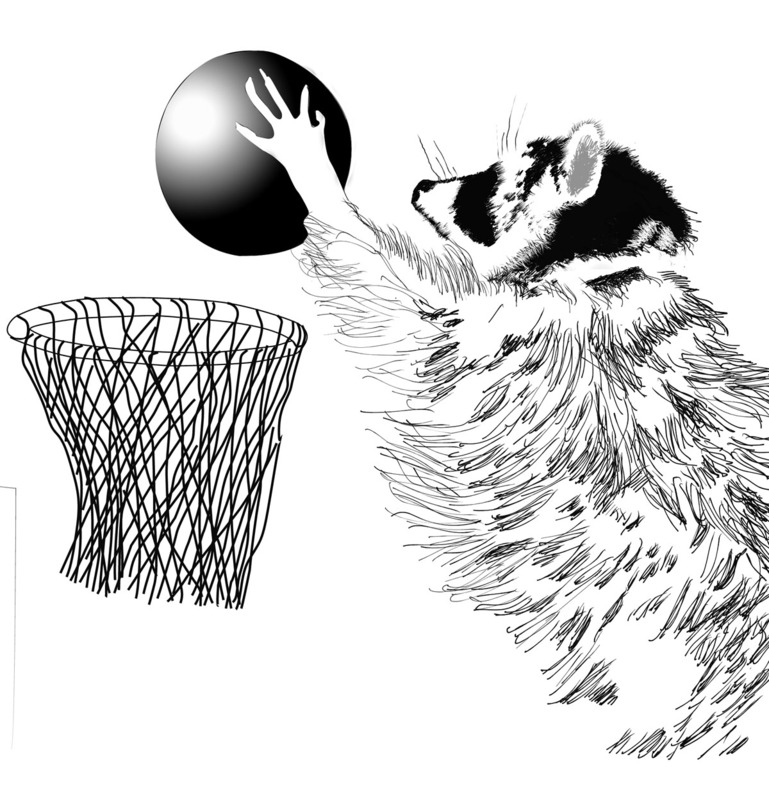 Instead, they trained the raccoon to play basket­ball. The basketball was so large that the raccoon did not attempt to wash it. The Brelands trained animals to do human-like tricks. Similarly, a pig was reinforced with food for dropping large wooden disks into a piggy bank. It learned this task. But soon the pig began dropping the coin on the way to the piggy bank, pushing it through the dirt with its nose, and flipping the coin up in the air. This is species-typical pig behavior called rooting. Again, the intrusion of a species-typical behavior actually prevented the pig from completing its task and receiving food reinforcement. What was strange about instinctive drift, with respect to reinforcement theory? The Brelands recognized that the phenomenon of instinctive drift contra­dicted 1950s-era reinforcement theory. The species-typical behaviors appear­ed even though they prevented a hungry animal from getting food reinforcement. Observations by people like the Brelands helped sway American psychologists toward the viewpoint of the ethologists. Instincts must be taken into account, and no animal is a blank slate: they all have preferred forms of learning and preferred tendencies of behavior, due to their species heritage. Thorndike was one of the few early researchers to recognize that some forms of learning were natural and others were not. Thorndike pointed out that trial and error learning occurred fastest when animals were (1) motivated; (2) prepared to learn; (3) paying attention to the relevant cues. In what way was Thorndike ahead of his time? How did Seligman use the "preparedness" concept? Seligman (1971) revived Thorn­dike's preparedness concept to explain some strange things about phobias (powerful, irrational fears). Seligman asked, Why are some phobias so much more com­mon and difficult to treat than others? The most common phobias involve spiders, snakes, and small animals such as rats. Other phobias can sometimes be treated with mild forms of therapy like bibliotherapy (reading) but these three types were resistant to treatment. In our modern world, far more people are hurt by hammers and electrical outlets than by spiders and snakes. Why, asked Seligman, do psychologists hear no complaints about hammer phobias or electrical outlet phobias? Seligman suggested that certain common phobias must be biologically prepared by evolution. Fear of snakes, spiders, rodents, heights, water, and enclosed spaces have one thing in common: they can save a person's life. If so, they preserve the DNA that encourages such a fear response. By contrast, we do not fear ham­mers and automobiles because they were not a threat to our ancestors. Therefore we have no built-in tendency to fear them. What argument did Seligman make about phobias? Seligman's article was very influential. In a 2016 article titled, "The legacy of Seligman's "Phobias and Prepared­ness," McNally (2016) noted that "his seminal article...continues to inspire research more than four decades later," deepening our understanding of phobias and prepared learning. McNally, R. J. (2016) The legacy of Seligman's "Phobias and Preparedness." Behavior Therapy, 47, 585-594. Seligman, M. E. P. (1970) On the generality of the laws of learning. Psychological Review, 77, 406-419.